Real Life :: The Peach’s Nightmares. Oh lord. Baby nightmares. Man, those night terrors are killing me. The Peach will all of sudden start calling for Mama around 2:00AM. 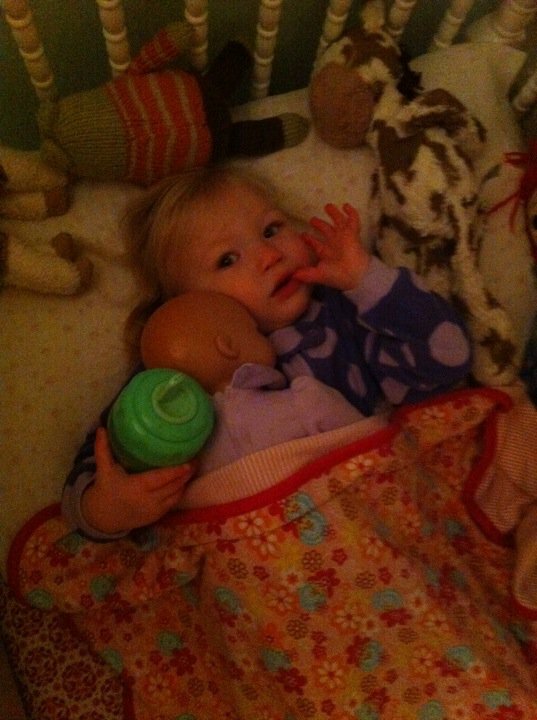 When I get to her crib, I realize she’s actually asleep, just wiggling in her crib. I pat her widdle bottom and shhhhh her back to happy dreams. But recently she woke up crying crying crying, “Mama! Mama! Light ON!!! Da Bunees falling DOWN!!! And PEACHIE FALL DOWN TOO!!! Who are these bunnies that are terrorizing my child’s sleep? These evil twins of DOOM. The Bunny Twins was actually my book growing up. I remember loving it. It’s actually just as cute an innocent as it looks. Bunny brother and sister having a blast. Of course chaos ensues from Flipper going too damn fast. Who does he think he is? Mario Andretti of the rabbit set? BAD FLIPPER! And Fluffy falls out and cries a cry of deep soulful pathos and pain. But by the next page they are off and hopping away to play blindman’s bluff! And yet, that one page is enough to send my little one into a fit of nightmare agony. And it’s killing me sleepwise. Oof! Has anyone else’s little one experience them? What did you do? Posted in Best of Dottie, Real Life, Real Life : Dottie. Tagged with bad dreams for toddlers, how to deal with night terrors, Night terrors, what causes night terrors. RUT ROH!! Cooper wakes up at least twice a night with “nightmares.” We have a video monitor so we watch him, and he usually falls back to sleep within minutes. I also wish I knew what to do…I have figured out that he gets up more like this when he’s had something sugary during the day- so I make sure to limit that. I think it also depends on the child. If Peach is the type of girl who needs reassurance and comfort to get back to bed then do it! But be careful about making habits. What a good point about the sugar. I’l def. keep an eye on that Tracy. I like the idea of a food book. I’m going to look into that right now on Amazon. My eldest had night terrors. My doc explained to me when i rushed her up to the medical centre at midnight because of her screams (she played happily while we waited). She is 10 now and still has an incredible imagination. both a blessing and a curse. It was so hard to wake her to stop her terrors so i became the dream whisperer. I whisper in her ear that i am there and that we are some place wonderful/magical. 2 nights ago miss 7 was yelling about the trains so i knelt by her bed and whispered about the gorgeous tea party we were having in the garden, describing the colours, smells, picnic spread etc and how I am there and we are safe and happy . That whispering trick is genius Jodie! What a love you are and what a great story! I’m going to try that tonight. can i have more emotions in a 2 second span reading this? and the responses? so dear! #1 “she calls herself PEACHIE?? be still my heart, that is the cutest thing i have ever heard!! #2 lol at the bunnies that are causing the pain. #3 jodie, that is the dearest response ever! #4 tru has them too. it’s amazing when they can sort of talk about them. we jut do the same, assure him he’s ok and lull him back to sleep with “it’s ok words.” my brother had night terrors so intense that he occasionally had to take a bath to wake himself up and calm down, the water was soothing to him. seems to be a trend for highly creative people! Poor Truman–that breaks my heart that he had them too. But I like this whispering in the ear trick. I love the dream whisperer – what a good mama! I don’t have any pearls of wisdom for the night terrors but if you think she’s really concerned about the falling down you could try addressing that. When my little guy gets upset because he fell (or even saw someone else fall) I always tell him “everybody falls down” and then we go through EVERYBODY…mommy, daddy, sissy, grandma, the dog…they all fall down. And to drive the point home just a little further I may even fall down repeatedly while I’m saying it. Probably not gonna help in the middle of the night but maybe if you talk about it and turn it into a game during the day? Ingrid was afraid of one episode of Yo Gabba Gabba where Plex the robot gets hit with a snowball and powers down. His eyes go blank and Ingrid would SCREAM every time that episode came on. And then have nightmares. We would just talk about it during the day to try to make it less of a big deal. are they true night terrors where you can’t wake her? if so, i’ve read that they become more terrified when you try to wake them because they see you as part of the nightmare and are frightened of you. my first had something like that (though i don’t know if they were completely night terrors). they were awful and we were at our wit’s end, but he fortunately moved through that phase quickly. oh no poor peach! i had (and still have, occasionally) night terrors as a child. my parents bought me a friendly blue light (a blue light bulb like you’d put in party string of lights ). that helped me be less scared by darkness/shadows when i woke up because it casts a soft un-scary light. i think as someone said, its a curse of creative types – i’d be scared of very benign things just because i’d interpreted them in some whacky lateral way that cast them in a weird light in my mind. eg: i banged up my knee last year throwing myself out of bed to avoid a bizzarro robo-spider that was obviously inspired by this nasty looking guitar my boy showed me earlier in the evening. who else has nightmares about guitars?! i hope you can find a way through this – and start getting some quality sleep for you too. If my little one can be as creative as you, I’ll be tickled pink! But I like the idea of the happy nightlight. Good stuff! but is that BABY or OTHER BABY next to her in that picture!?!?!? That would be “Other Baby” when she was new enough to still have clothes on. Those days are over, my friend. oftentimes night terrors can happen after a particularly stimulating day. even when it’s fun stimulation, it can be overwhelming for the kids. it’s something to keep an eye on when the day is rock and roll — frequent breaks/quiet spaces may help? My daughter (9 yrs old) has had night terrors ever since she was given Tamiflu. She gets them when she is sick or when she has had a traumatic day. She has true night terrors where it is very hard to wake her. She will walk downstairs to find us with eyes open but won’t actually be awake. They are extremely stressful for me. We have had 3 different techniques work successfully but not each works each time so we have to try to see what works first. Sometimes I calmly talk to her about her best buddy and try to carry on a conversation with her about what him. That has worked to snap her right out of it. Sometimes, my husband has turned on all of the lights and talked to her which snapped her out of it. Mostly, what seems to work is just cuddling her and allowing her to calm down, never fully waking & she goes back to sleep. She never remembers it afterwards but she does give us a glimpse of the dreams and they’re equally odd as adorable bunnies! Just hearing about the tamiflu incident is scaring me. But I’m glad your daughter doesn’t remember the night terrors. But I like the cuddle approach in particular! My oldest, with a huge imagination, had bad dreams until my Mom went on a trip to the southwest. She bought a real 3-dimensional dreamcatcher with a kachina in it and it came with the actual story of the kachina and his job. We read the card to Zach and explained what the dream catcher and kachina would do; hung it up in the window and … what do you know – it worked. You, a friend of my husband recommended that too! Maybe I do need to think about getting one. These comments have been so very helpful, lady! I can’t thank you guys enough! Nice post. Imagining the bad characters in your dream failing may be helpful in decreasing night terrors. Thanks for sharing.